Several districts in Karnali Province reel under medicine shortage every year. And this year is no different. Though the government provides 70 types of essential medicines for free of cost through district hospitals, 56 kinds from primary health centres and 35 varieties of medicines through heath posts, tens of thousands of people in Karnali Province are compelled to pay for these otherwise freely available medicines. This is because the government-run health centres, particularly in far-flung areas, do not receive regular supply of medicines. Twenty-five-year old Tara Dhami of Patala-6 in Kalikot said when she recently visited Khin Neta Health Post, the health workers there told her to buy her prescriptions from a private drugstore, citing medicine shortage. “I had reached the health post after suffering from stomach-ache, and the health workers tell me that they cannot offer me medicines,” she said. Like Dhami, there are many people who are asked to visit private pharmacies to buy medicines that ought to be freely available to the public. Civil Society leader of Kalikot Lilaram Neupane said most people do not have the knowledge about free medicine programme and the government health facilities do not bother to tell them. In Mugu, the government health facilities in Khatyad, Soru and Mugamkarmarong rural municipalities are without medicines for a long time. Karma Tamang, a resident of Mugamkarmarong Rural Municipality, said the villagers had to walk for up to two days to reach the District Headquarters in times of sickness. “You do not even get Paracetamol tablets if you visit the health posts in our region. You visit any health post at ugu, Pulu, Magri, Kimri and Dolphu, the health workers there will tell you that they do not have medicines and visit the District Hospital, ” he said. The District Hospital itself is not so secure when it comes to the supply of essential medicines. The case is similar in the districts of Humla, Dolpa and Jajarkot. Health officials in these medicine-insecure districts blame the recently elected local governments for not doing enough to maintain regular supply of essential medicines. 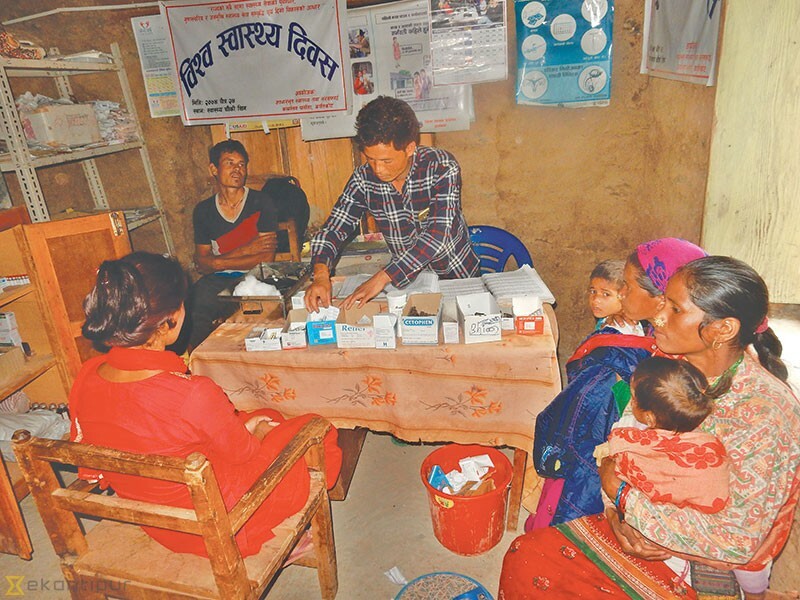 Their argument may have some truth in it, but medicine shortage is not a recent crisis to hit these remote Hill districts of Karnali Province. Many people here see this as a failure of the erstwhile governments to identify the perennial problem of Karnali and take necessary steps to address it.